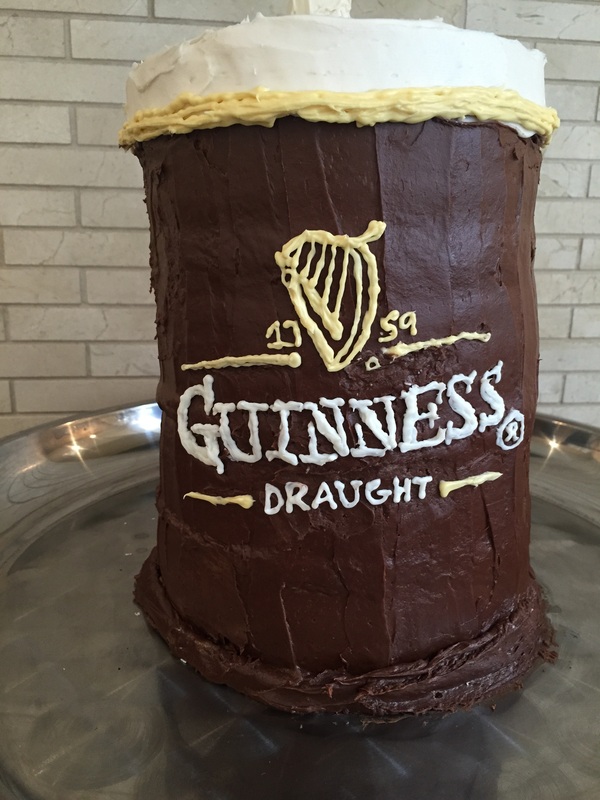 Saint Patrick’s Day Guinness Beer Cake! On the weekend I attended a Stag and Doe for my boyfriend’s brother. 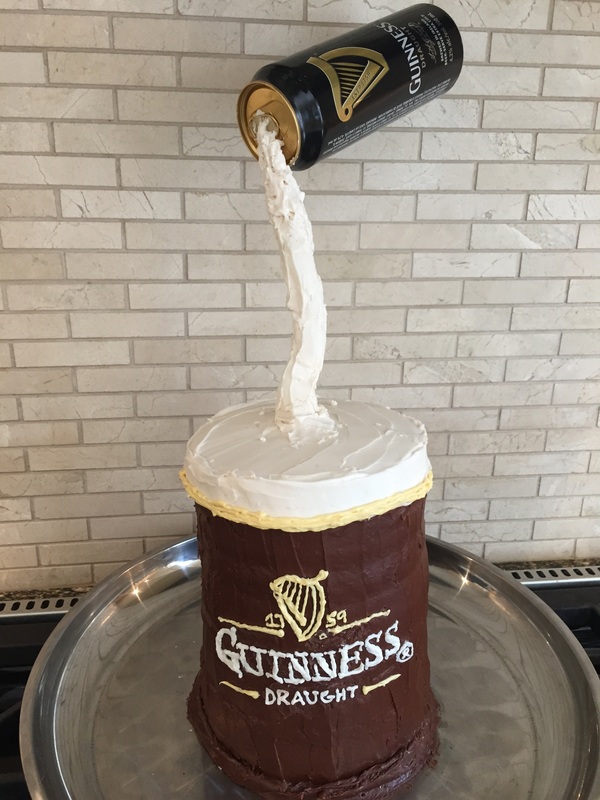 It was a Saint Patrick’s Day theme so I decided to make this Guinness cake for them. After all…you can’t celebrate Saint Patrick’s Day without a Guiness! If you look further back in my blog you will see the Budweiser beer-mug cake that I made. Since this was my second time around making it, I have started to perfect the construction of these! I was happy with how this one turned out as well and it was a huge hit at the party! It was such a hit, that everyone was too afraid to cut into it and instead were taking tons of pictures of it! Moments like those make me realize why I love doing this type of stuff so much! Your favourite cake mix and icing (any kind will work!) I went for white cake and white icing so I could easily dye the icing. White fondant, I used some to wrap the balloon holder with so the icing would stick better to it. Fool colouring “gels” It’s perfectly fine to use your everyday liquid food colouring but I bake a lot and this pack by Wilton I got on sale at Michaels and has a ton of colours! Again I used a 40% off coupon so I got the whole pack for around $12.00. You only need to use a little bit and they will last a really long time. The colours are great and it helps in not throwing off the consistency of your icing, etc. 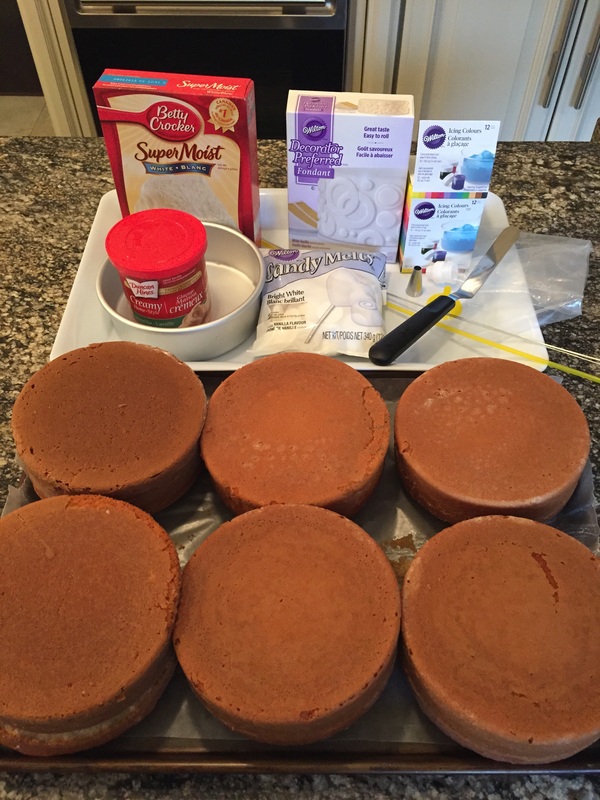 Bake your four 6″ round cakes and LET COOL COMPLETELY! I didn’t cut the top off my last layer as I knew I was going to be adding a lot of white icing to add the effect of foam so it helps if it’s already rounded! Next I iced my cake using just regular store-bought chocolate icing so I didn’t have to play around with any gel colourings this time around. For the foam I mixed a little bit of white icing with the brown so that it wasn’t stark white since Guinness foam has a little brown tinge to it. I used the golden coloured gel mixed in with a little bit of white and brown for the gold detailing. 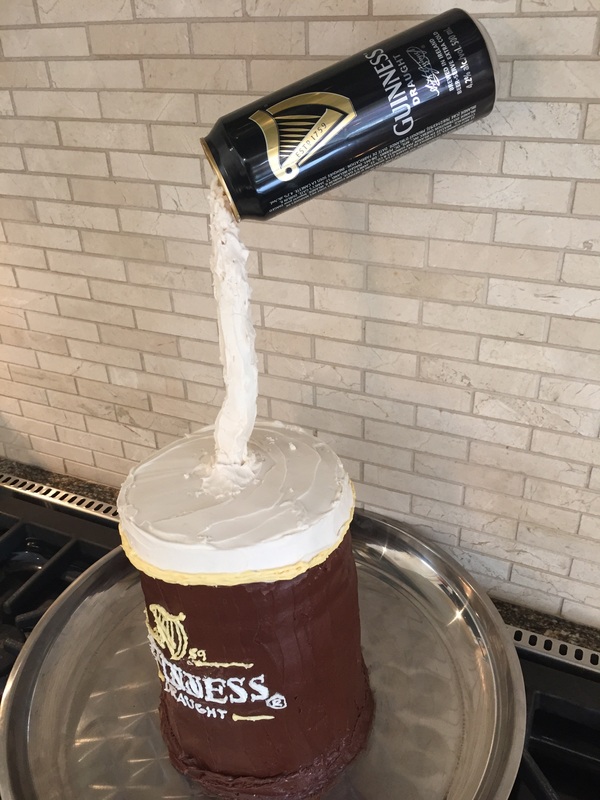 Next I stuck my balloon holder with flower wire right into the cake and then into the beer can. To help reinforce I turned the pop-tab on the top of the can so it was covering the hole in the can and this helped it hold really well! I then iced the ballon holder with the same colour icing I used for the mug. Again, the messier you can be here the better result you will get! I had to keep repeating this step a couple of times until the icing hardened. I added some of this icing right up into the mouth of the can to make it look like it was coming out of it. To get the logo as close to the real deal as you can simply print off the logo and trace it onto parchment paper using edible gel writers. You can then transfer this directly onto your cake and fill it in (remember your cake needs to be pretty much dry to do this otherwise you will just take your existing icing off with you when you pull the parchment off.) 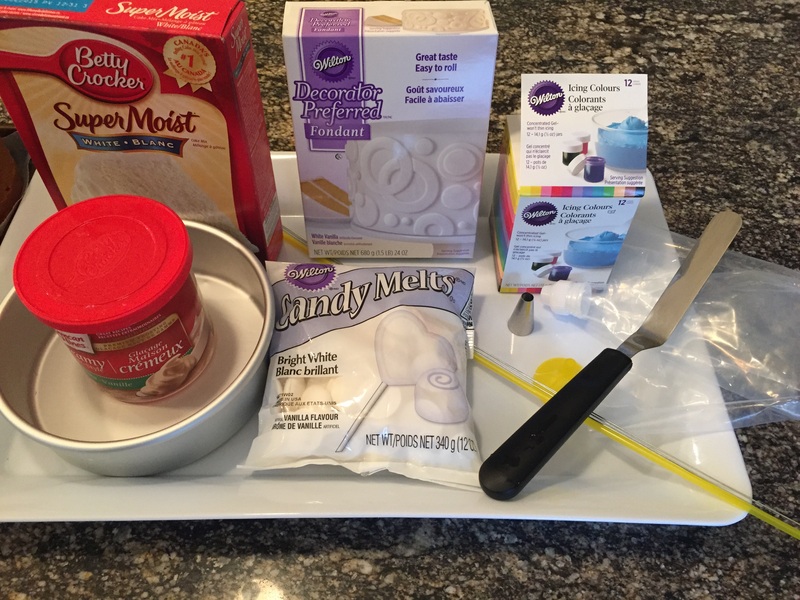 This was an awesome and extremely helpful trick I learned in my Wilton cake decorating course, and one that I will use for many cakes to come!